Some restaurants start out with a lot of hype when they first open, but eventually become more in the way of relatively unknown neighborhood spots once the hype dies down. This was certainly the case with the now-closed Townsend's in Hyde Park, and it seems to be the case--to a lesser extent, perhaps--with a place in Dorchester called the Ashmont Grill. When this upscale comfort food spot first opened back in 2005, it immediately made a big splash, perhaps because the person behind it--Chris Douglass--also ran a highly-regarded and very popular spot in the South End called Icarus (which is now closed). But even though the place remains popular among locals, industry folks, and people who are familiar with the Boston restaurant scene, the Ashmont Grill isn't quite a household name these days, perhaps due at least in part to its location away from main highways, bustling neighborhoods, and areas seen as dining destinations. From the outside, the Ashmont Grill basically looks like what it is--a slightly chic and trendy spot that would not be out of place in, say, the South End or parts of Brookline or Cambridge. The interior features a nice mix of modern and rustic touches, including a beautiful bar area that is backlit in blue, a dark and somewhat romantic main dining area with attractive hanging lights, and a vaguely industrial overall feel coming from the exposed brick and the pipes running along the ceiling. The hardwood floor can make the noise level a bit high (especially on weekend nights), though the noise level doesn't reach the level of some other upscale comfort food spots in the Boston area. For those who like to dine outdoors, the Ashmont Grill has a cozy and private-feeling patio in the back, complete with a fire pit, trees, and strings of lights above the metal tables. The Ashmont Grill focuses mainly on inventive takes on American dishes, with most items served at relatively reasonable prices. While the offerings change depending on the season, starters include such items as a fresh Caesar salad with house-made herbed croutons, an earthy-tasting beet and arugula salad with soft goat cheese, mushrooms, and almonds, wood-grilled hakurei turnips with a sesame-teriyaki glaze and sauteed turnip greens, pan-seared Brussels sprouts mixed with little cubes of lomo (a type of cured pork tenderloin), a caramelized turnip soup with a pesto drizzle which is sadly only on special, a roasted carrot soup with cilantro (also on special) that gets a slight kick from chili oil, a hummus plate with nicely-textured lamb sausage, a "Ploughmans Platter" that features a variety of cheeses and meats, a marvelous plate of pickled veggies, and the "Train Wreck" fries plate, which consists of hand-cut fries, bacon, jack cheese, hot peppers, scallions, and sour cream. Among the main courses are an outstanding burger made with all-natural Niman Ranch beef, a moist turkey burger with avocado puree, a zingy macaroni and cheese with a bit of smoked blue cheese, baby back ribs that are applewood smoked and come with a sweet and smokey apricot-chipotle glaze, a rigatoni bolognese whose sauce includes a perfect blend of beef, veal, and pork, pan-seared salmon that comes with different veggies and sauces depending on the season (and sometimes comes with chickpea fries), a salmon burger with a charred lemon aioli, fall-apart tender and flaky beer-battered fish and chips that would give some seafood shacks on the MA coast a run for their money, and a wood-grilled steak that comes with spicy potatoes and chimichurri. As mentioned earlier, because the Ashmont Grill does a lot with seasonal dishes, a number of other excellent items are available only from time to time, including splendid grassy-tasting fiddleheads in garlic and oil, fettucini with a delightful mix of fava beans, oven roasted tomatoes, asparagus, and garlic cream, roasted chicken with a potato croquette and sauteed broccolini, and a meaty portobello burger that even those averse to vegetarian dishes will probably like. Desserts include a sweet and sticky toffee pudding with whipped cream, a marvelously rich and moist carrot cake, a sinful brownie sundae, and a complex-tasting chocolate-hazelnut tart with brandied cherries and Grand Marnier ice cream. Beer and wine lovers should be able to find something to their liking at the Ashmont Grill, but the cocktails seem to be the way to go here, with great versions of negronis, old-fashioneds, sidecars, and manhattans, along with a sweat-inducing "hot and dirty" martini. Folks in the media and people who work at restaurant may not consider the Ashmont Grill to be a hidden spot, but its somewhat obscure location in Dorchester's Peabody Square seems to have turned this place into a mostly local hangout. Whether it is a truly hidden gem or not, however, the bottom line is that this eatery is a great option for those who like both traditional American and New American cuisine at mostly decent prices in a comfortable environment. The hype may be over, but the Ashmont Grill continues to impress a number of years after its initial opening. 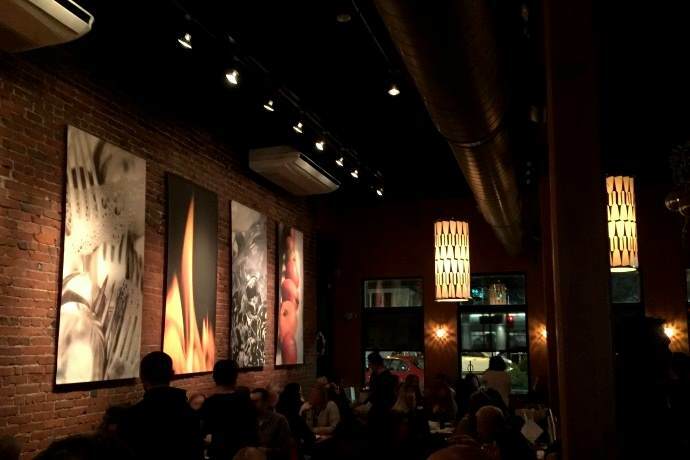 Copyright © 2012-2019, Boston's Hidden Restaurants (www.hiddenboston.com).